Nature Worlds is my 2nd addin for my 4th generation (after Stones of Harmony). It features graphics made from GIMP instead of Auto Shapes from PowerPoint. The levels on this addin comes with a large difficulty on going to other worlds of nature. From woods to oceans, deserts to caves, it really matters what will Mother Nature could do? It represents Mother Nature living in Nature Worlds on what she does on her righteous freedom. 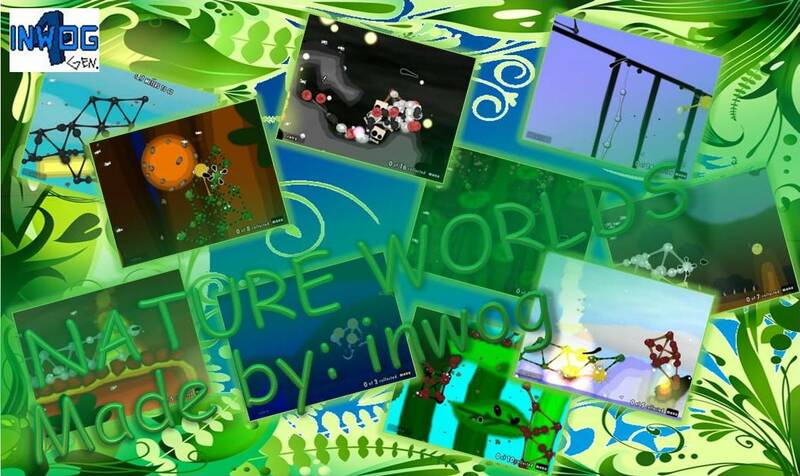 There are mainly 10 levels in Nature Worlds, each of the levels will only feature 1 world per level. Depends on the difficulty, the levels could get any worse than my other addins. 1. Woodland Hideout - focuses on sticking to wheels. 2. Human Nature - focuses on rescuing balls with burning structure. 3. Water Hibernation - focuses on water bouncing. 4. Cavern of Lights - focuses on rock moving. 5. Jungle Swing - focuses on swing Ivy strings. 6. Rock Me a Dash - focuses on the zip-line. 7. Ocean Depths - focuses on maneuvering obstacles. 8. Diamond Coast - focuses on bridge building and block stacking. 9. Lava isn't a Rush - focuses on lava crossing. 10. Nocturnal Run - focuses on flying and spikes. Nature Worlds offers 5 different languages to choose from: English, Spanish, Italian, Dutch, French, and German. 1. The level "Human Nature" seems that the plants are human size. 2. Only "Rock Me a Dash" is the only level name which doesn't describe the environment. 3. "Diamond Coast" was renamed three times (Firstly it was named "Poison Ivy", then second, "Hundred Islands"). 4. "Nocturnal Run" is the only level that has custom particles. 5. The level's name "Lava isn't a Rush" comes from the show Big Time Rush (Big Time isn't a Rush). Version Summary: After I made the addin Stones of Harmony, I was thinking about nature since when I was at school. I built the levels by sketching them before placing them in the Editor. At the very end of the project, I'm a bit frustrated making the cutscene with a lot of images needed to make, so I'm pretty sure you're going to enjoy this! It'll take me months to get through this, but the game doesn't crash so I'm just publishing it now. I didn't see the particle effect at the tenth level, but it was a good one!